The South Gondola Lot is full on March 14 in Breckenridge. 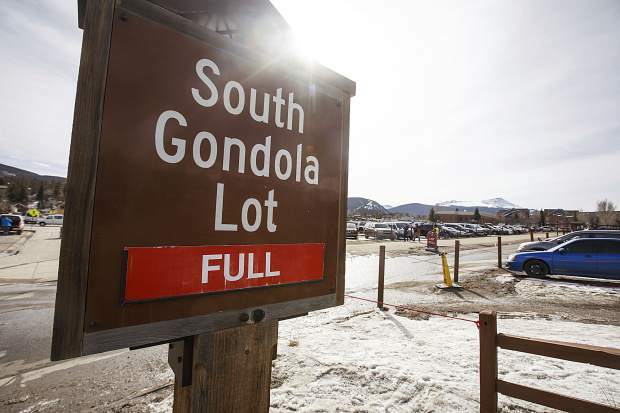 The town has decided to start charging for parking at the South Gondola Lot this summer, a move that’s designed to match paid parking across the street at the North Gondola Lot, according to the town. After breaking ground on a new water treatment plant, Breckenridge Town Council took on a number of other items during its work session and subsequent regular meeting on Tuesday, including deciding to implement paid parking in the South Gondola Lot this summer. The decision was made to match paid parking at the North Gondola Lot, which sits directly across the street, according to the town. In other business, council unanimously passed a “dig once” ordinance with the goal of limiting utility disturbances in the right-of-way for underground utility work on first reading. According to a memo from town staff, the ordinance would ensure broadband is installed with all town projects, when utility companies are performing work in the right-of-way and with new developments. Representatives of Xcel Energy and Comcast expressed some concerns about the proposed ordinance, including their fears over shared permits, a co-location policy, the process for issuing notifications and cost-sharing, but thanked the town for the opportunity to offer more information before the ordinance comes back on second reading. Additionally, council designated “The Poor House” at 307 S. French St. as a local landmark, also on first reading. Sought by the owners, the tag will make the property eligible for more grant money than it otherwise would be, according to town staff. It was also announced that 21 letters have been submitted by people interested in filling a vacant council seat. The deadline to apply was April 18, and the number of applicants is up from four just two weeks ago. Council is expected to vote on a possible replacement May 22. On Tuesday, council also rescheduled its meeting originally set for June 12, the second Tuesday of the month, to June 5.